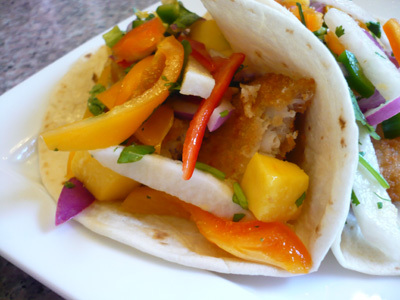 I’m always will to try a great new salsa to top chicken tacos or fish tacos. This salsa is so summery and refreshing, and it went great as a topper for fish tacos. I saw a recipe for jicama salad in the March 2009 issue of Cooking Light, which was the initial inspiration of my mango jicama salsa. Combine all ingredients in a bowl. Taste and adjust seasoning if necessary. Top your tacos, and enjoy.